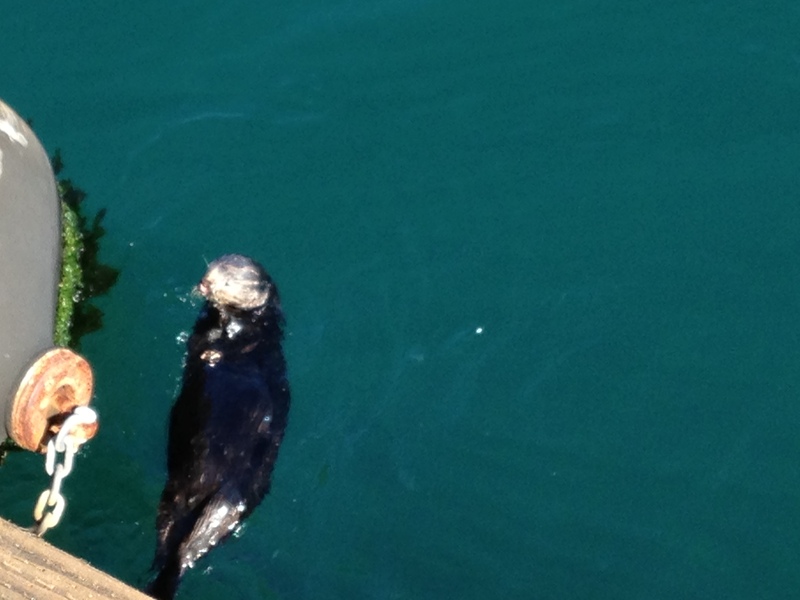 Yesterday, the wife and I visited Monterey Bay. For the ocean lover it’s a hard to beat stop on the California One. We were lucky, only two hours from San Luis Obispo. Our journey wasn’t as thorough as hoped, but we fit in what we could. The purpose of the trip was to visit my brother and grandfather, the pair have been working in the bay. 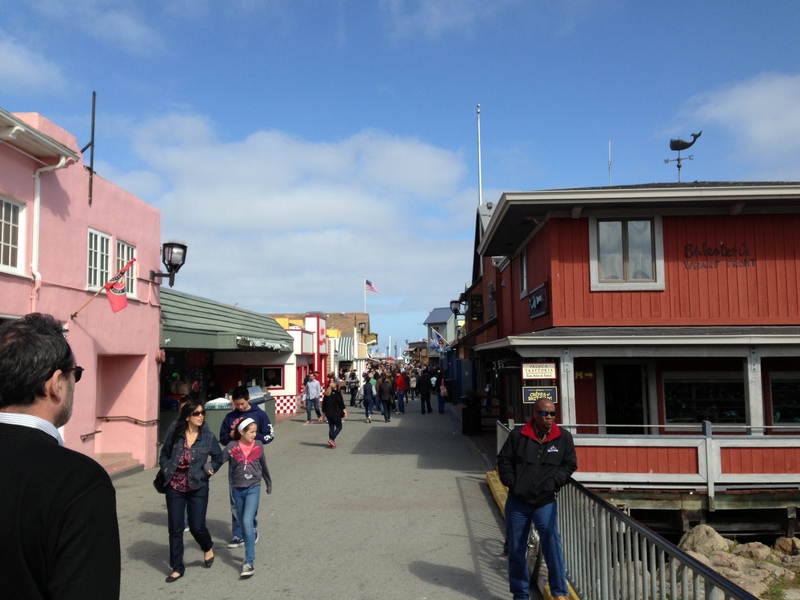 We arrived earlier than they were ready to meet for lunch, so we stopped at Fisherman’s Wharf to explore. The Wharf is great. There were two boardwalks—one built for tourists with shops and restaurants and another for the fishing industry—and both can be traveled upon. The first, more touristy boardwalk, carried hostesses outside of their restaurants offering clam chowder samples. Later, my grandfather called these people barkers, I guess that’s a term. The other boardwalk, or pier, was more true to fishing and marine life. It was there we looked down and saw a lonely otter, dipping below the water and returning with fresh muscles from the pier side. The otter did lay beautiful on it’s back as we watched, with a better view than those paying aquarium admission, her break open the shells and eat the ill-fated, squirmy treasure. The entire Wharf, as you’d imagine, was surrounded by sailing boats and fishing vessels. As a former student of the Fall semester North Idaho College sailing class (no big deal here), I must admit my ocean-loins were raging. Is that a thing? As I was saying, the boats of the Wharf were something to see. I’ve never been on a ocean vessel; it is a dream of mine and I hope to sail the seas someday. Just as our parking spot, we ran out of time. 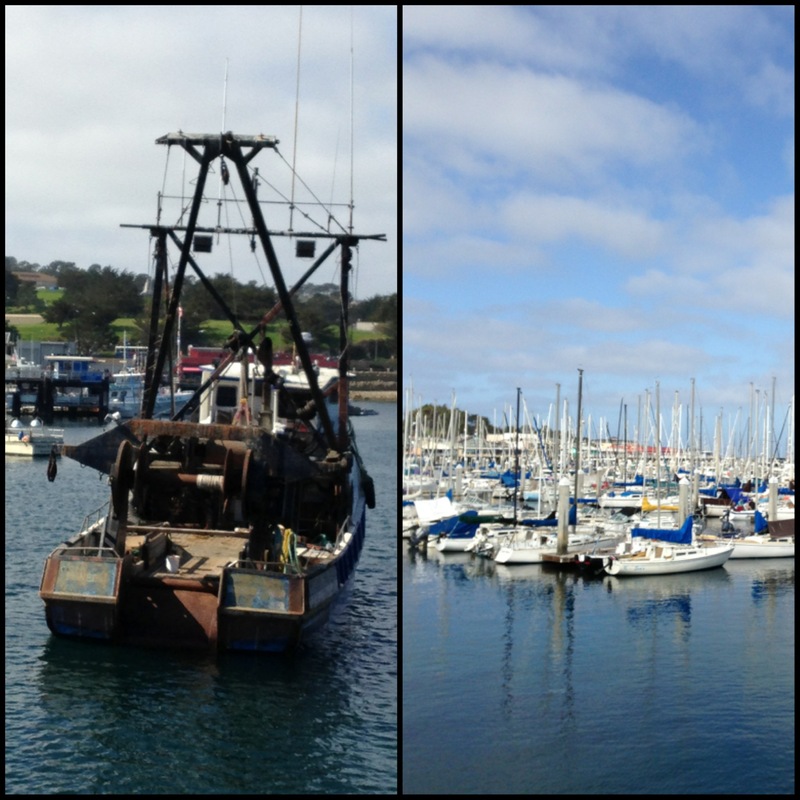 We left the Wharf and joined my brother and grandfather in Moss Landings, just north of Monterey. A small town who doesn’t offer much except fresh seafood, a quaint beach, and (on the way in) a killer farm stand, Moss Landings was quite enough for me. 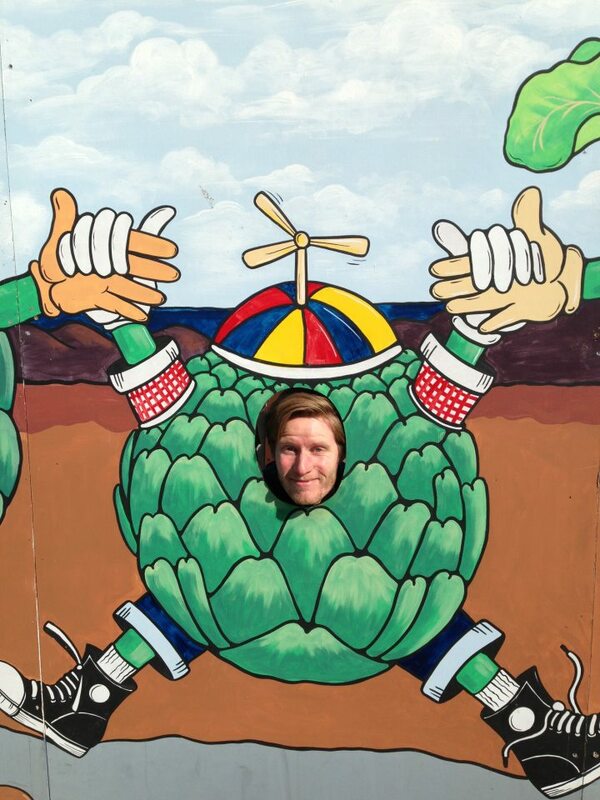 Impulsively, we swerved off the road and stopped at a farm stand offering “Artichokes 10 for $1”. As any green-blooded american would expect, we went to town on produce. Kiwis, avocados, jalepenos, pistachios, a big jar of garlic-infused olives… and of course artichokes. 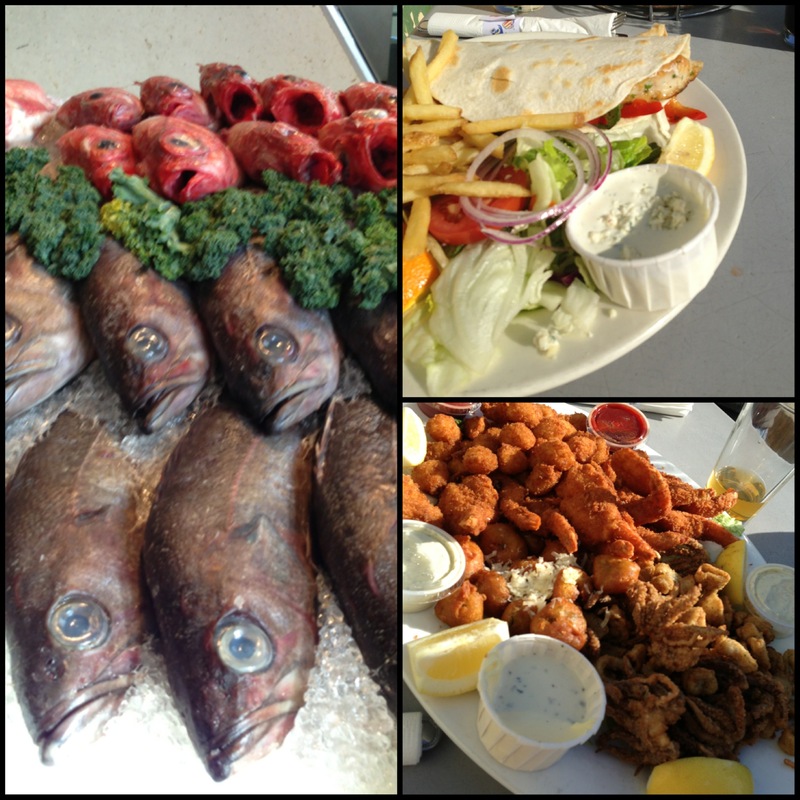 Finally, we ended up in Moss Landing at none other than world famous Phil’s Fish Market. I had never heard of this place before, but apparently it’s a big deal. Just like the website asks, I too wondered, “is this worth the wait?” The line petered out the front door into the parking lot. I didn’t realize it then but we were probably the last of fifty people in line. The line was so long in fact, we ordered drinks as we stood. I enjoyed a tasty Guinness. It’s too easy to forget how well the beer pairs with seafood. (A lesson I first learned from my Ireland trip). The food, the beer, the catching up; it was all great. My brother and I shared a platter of deep fried seafood; we haven’t done that since we were children. My grandpa always teases me about my childhood fear of thinking the deep-fried squid were deep-fried spiders. Some things they’ll just never let go. As tasty as the food was, I must admit, the best part was not the food itself. Anyone can deep fry a squid. The best part of Phil’s was the atmosphere. We sat outside and enjoyed the sound of the waves and the heat of the sunshine. After, we all walked along a short trail, just outside the restaurant, to the beach. It was the first time I can ever remember going to the beach with my grandpa. He spoke of the hassle he felt the ocean’s shores to be. The sand, the wind… But even he, my grandpa, was enjoying himself at the beach that day. As I get older, times like these become more and more special. Our sky made ready for the night. The sun began to dip cautiously into the horizon like a match extinguishing in water. We all looked on. As a final end to our travels, a pair of otters broke the surface to bid us all a good day’s journey and a safe passage home. Did you get to go to Cannery Row? The statue of Steinbeck is there. I’m so glad I didn’t eat at Cannery Row, and that I headed to the old Fisherman’s Wharf instead. Touristy but I like the charm of the place including the downtown area. We did get to go to Cannery Row! The Steinbeck statue is pretty great. I grew up in a house in a town named Oceano (here in San Luis Obispo county). The original owner of the house was a famous doctor who had one or to famous guests come by. One of which was Steinbeck!